I remember Fred Downing, and his wife Win, too. They were my next door neighbours in The Avenue for several years in the late 1970s until we moved house in 1983. Fred would either be pottering in his vegetable patch at the bottom of his garden or working in his shed. We just had a low wire fence between our two gardens. This was made out of stranded rigging wire as Fred had once worked in the Wivenhoe Shipyard for part of his life. Over that fence he would tell me lots of stories. I would listen but, sadly, I cannot remember them clearly enough to recount them. I do remember him telling me that he worked for some time helping to erect the electricity pylons which would being this ‘new-found electrickery’ to homes in north-east Essex. Each pylon would take about a week to erect, I think it was. He used to cycle to work which was fine in the early days because the pylons were close to Colchester but, as each week passed, he found himself cycling further and further each day, until they reached Harwich some 12 miles away! Fred, like many people in Wivenhoe in those days, would never have earned enough to be able to run a car. How things have changed. Fred was born in Wivenhoe in 1902; one of three boys – Guy and Philip were his brothers but I don’t think they were close at all. At the age of 15 he started work in the Wivenhoe Shipyard as an apprentice rigger, towards the end of WW1. He joined the crew of the Rosabelle fora time and also, in WW2, he worked on the sections of the Mulberry Harbour which were built here in Wivenhoe. Inspiration to build a detailed replica of a Thames Sailing Barge came from an illustration from a book which his wife had bought for him as a present. Fred was very thorough and he took many hours to hone the hull of this model on a vice in his shed. Each week he used to show me his progress on the model. When Fred died, his wife Win asked me if I would like anything of Fred’s to remember him by. I still treasure Fred’s vice today and is mounted on my workbench in my garage. 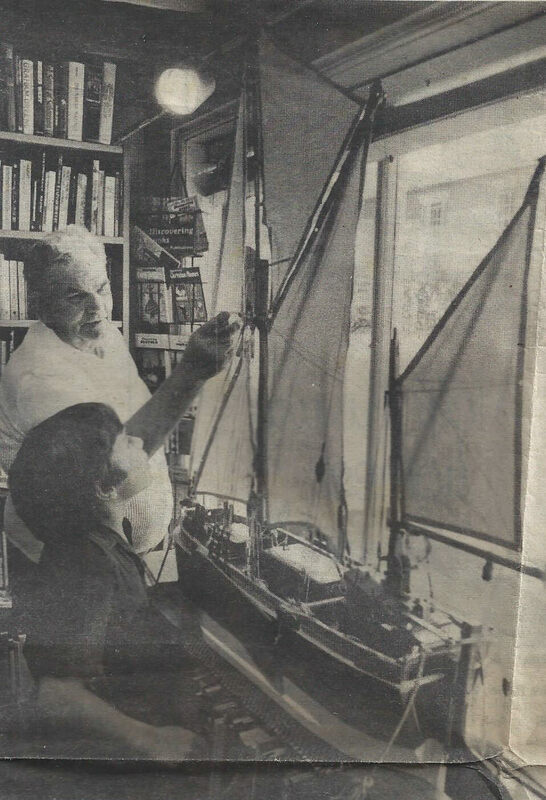 As Win had bought that book from the Wivenhoe Bookshop, it was fitting that Fred’s model of the Thames Sailing Barge went on display first in the Bookshop. It was later moved to the Nottage Maritime Institute. Fred was a lovely, gentle man but had clearly worked hard throughout his life. He was certainly built of stern stuff.